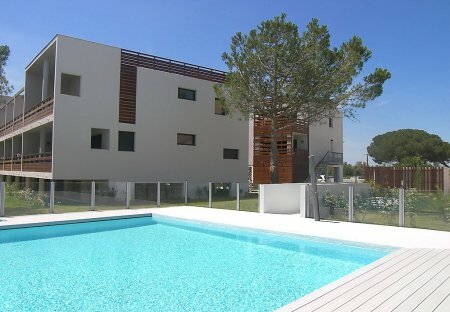 Rent villas and apartments in Saint-Cyprien Peripherie, the South of France with private pools. Book affordable holiday rentals that are near a beach and golf course. This 3 bedroom house with private pool is located in Saint-Cyprien Peripherie and sleeps 7 people. It has WiFi, air conditioning and a garden. The house is near a beach. This 1 bedroom apartment with swimming pool is located in Saint-Cyprien Peripherie and sleeps 4 people. It has WiFi, air conditioning and a garden. The apartment is within walking distance of a beach. This 2 bedroom house with swimming pool is located in Saint-Cyprien Peripherie and sleeps 6 people. It has WiFi, air conditioning and a garden. The house is near a beach. This 2 bedroom apartment with swimming pool is located in Saint-Cyprien Peripherie and sleeps 6 people. It has WiFi, air conditioning and a garden. The apartment is within walking distance of a beach. This detached holiday villa, which features a well-maintained garden and private swimming pool, is located only 700m from endless miles of golden sandy beaches. This pretty and charming small holiday house is located in a residential area with wide tree-lined streets. It is a family holiday home in the village Saint Cyprien. This small but pleasant and well equipped terraced house is located only 660 yards (600m) from the large golden sandy beaches of the lovely family resort of St-Cyprien. This 1 bedroom apartment is located in Saint-Cyprien Peripherie and sleeps 5 people. It has WiFi, parking nearby and a gym. The apartment is within walking distance of a beach. This 1 bedroom apartment with swimming pool is located in Saint-Cyprien Peripherie and sleeps 3 people. It has WiFi, a garden and parking nearby. The apartment is within walking distance of a beach. This 1 bedroom apartment is located in Saint-Cyprien Peripherie and sleeps 4 people. It has WiFi, parking nearby and a gym. The apartment is within walking distance of a beach. This 1 bedroom apartment with swimming pool is located in Saint-Cyprien Peripherie and sleeps 5 people. It has WiFi, a garden and parking nearby. The apartment is within walking distance of a beach. This 1 bedroom apartment with swimming pool is located in Saint-Cyprien Peripherie and sleeps 4 people. It has WiFi, a garden and parking nearby. The apartment is within walking distance of a beach. This 2 bedroom apartment is located in Saint-Cyprien Peripherie and sleeps 4 people. It has WiFi, air conditioning and parking nearby. The apartment is near a beach.